Pavel Šporcl, internationally acclaimed Czech violinist, recently visited Galilee Medical Center and gave a surprise concert for patients, visitors and staff in our Surgical Wing lobby. He also played in our Pediatric Surgery Department for hospitalized children including the last Syrian child receiving medical care in Israel. Pavel visited Galilee Medical Center as a guest of our Friends organization which among its activities, promotes projects that integrate art into the public spaces of the medical center. During her recent visit in Israel, Zoë Riekes, President of AFGMC, spent a day at Galilee Medical Center. During her visit, Zoë got a first-hand view of some of the projects supported by Friends of GMC, such as the new Women’s Health Wing and the new Simulation Center. Zoë visited the new Cardiology Department named for Irving and Cherna Moskowitz and met with Dr. Attar, Head of the Department. Galilee Medical Center is constantly improving hospital surroundings and conditions for women in labor. Along with new delivery rooms and a spacious department featuring private or double rooms, we emphasize and encourage the women to breastfeed and tend to their newborn, keeping them close by to them, in the same room. Happy New Year from American Friends of Galilee Medical Center! Galilee Medical Center is thrilled to share the following video clip of Amir Yarchi , CEO Friends Of Galilee Medical Center,speaking to ILTV about hospital’s all new Irving and Cherna Moskowitz Heart Center. The Irving and Cherna Moskowitz Heart Center is entirely protected and the first of its kind in Israel. We are proud of this accomplishment and the recognition it has brought to the hospital. This is a huge advancement for GMC and we are grateful to the Irving and Cherna Moskowitz Family Foundation and other generous supporters for making it possible. We’re proud and excited that five Galilee Medical Center physicians are included in Forbes Israel 2018 distinguished list of “Best Doctors in Israel”. Dr. Eyal Sela, Director of ENT, Head of Neck Surgery; Dr. Eli Kakiashvili, Director of General Surgery Department A; Prof. Samer Srouji, Director of the Oral and Maxillofacial Surgery Department; Dr. Irith Weissman, Director of the Pediatric Nephrology Department and Prof. Menachem Neumann, the Head of the Oro-Gynecological Service in the Women’s Health Wing. Dr. Eyal Sela is Director of Galilee Medical Center’s Ear Nose and Throat Head and Neck Surgery Department. Dr. Sela has accumulated extensive experience in his field in Israel and around the world, among others, when he worked in the Department of ENT and Head Neck Surgery, and a center for reconstruction at McGill University, Montreal, Canada. 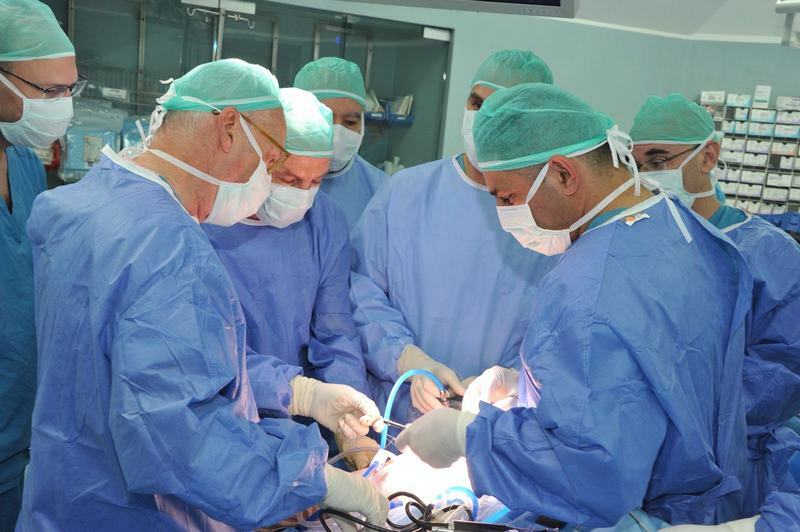 Dr. Eli Kakiashvili is the Director of Galilee Medical Center’s Department of General Surgery A. He is a leading expert in Israel and Europe in the field of general surgery, oncology, liver and biliary surgery, and conventional surgery (open) and robotic and laparoscopy surgery. Prof. Samer Srouji, Director of Galilee Medical Center’s Oral & Maxillofacial Surgery Department, received a Ph.D. in the Technion’s Faculty of Medicine in the field of tissue engineering. Prior to his arrival at Galilee Medical Center, he served as Director of the Bone Research Laboratory at the Technion’s Faculty of Medicine and he was a Senior Physician at Carmel Medical Center. Prof. Srouji completed an advanced course in endoscopic surgery in the Oral and Maxillofacial Surgery Department at Baptist Medical Center in Miami, Florida. Dr. Irith Weissman heads the Pediatric Nephrology Unit, which serves all the residents of the Galilee and is considered a leader and experienced in this field. Prof. Menachem Neumann, the Head of the Oro-Gynecological Service in the Women’s Health Wing, has many years of experience in his field and is an integral member of women’s health services at the Medical Center. For the first time ever, Galilee Medical Center performed a Meniscal Transplant surgery on an 18 year old. Dorian Dahan from Moshav Tzuriel was the first at GMC, and only the third person in Israel, who has undergone this complex surgery. The surgery was performed by the Senior Physician in the Department of Orthopedics “A”, Dr. Einal Bathish, is a specialist in knee surgery and sports medicine. He shared: “The surgery took 90 minutes less than was expected and we started physiotherapy treatments immediately after Dorian had a chance for some rest and recovery. I believe that he will be able to return to weight-bearing on his leg within a number of weeks and have a better quality of life due to the surgery. It is important to note that there is complex preparation in order to perform this type of surgery. Galilee Medical Center, headed by Dr. Masad Barhoum, went forward in line with its policy to promote advanced and leading services at a national level, which have developed in the last number of years at the Medical Center”. The surgery took approximately two hours, and multiple senior surgeons participated to ensure the best possible care from Dorian. We hope Dorian has a smooth and easy recovery! Read more about the complex surgery and Dorian’s story here.